For a couple of years now, I have been leading a secret, double life. By day, I am the The Renaissance Troll, but by night, The Osprey Quizmaster. A couple of years ago I wrote The Military History Quiz Book. 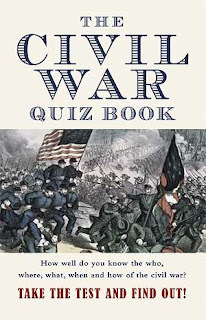 Well, the book proved a hit, and I was invited to return and write a similar book devoted to my favorite military history topic, the Civil War. 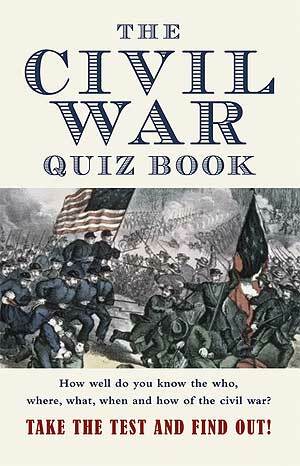 Last week The Civil War Quiz Book was released to the public. So if you fancy a bit of a challenge, check it out. It’s got over 1,000 questions, divided into 100 quizzes. It starts relatively easy, but becomes nearly impossible by the end. It’s perfect for annoying your friends and stumping your enemies. So, do me a favor; buy my book! Write a nice review for Amazon. Tell your friends. Give one to your father for father’s day. If you do pick one up, let me know what you think. My British friends find it very amusing that I took bowling in college. Somehow it fits perfectly into their ideas about America. Personally, I think the two units of physical education that the University of Carolina required me to take were part of the well-rounded education I received. A true Renaissance Troll must be well versed in the physical as well as the mental. So, along with a top-notch education, I left Carolina with a bowling average of around 140, which was more than enough to keep me competitive in the rare instances since when I’ve gone out bowling with friends. Last Friday, I was down in London with a couple of workmates, setting up the company stand for a show on Saturday. With our work completed by 4PM, one of our number became obsessed with the idea of going bowling. After a bit of trouble, we managed to locate a bowling alley. It was a small, cramped, junky place, but, that early on a Friday, it was essentially empty. The ball selection was pretty meagre, and the only one I could find to fit my fingers, was a battered 10-pounder. I scored a 107 in my first game. Then I found the grove. After a poor first frame in the second game, I bowled my best game ever. I bowled a few strikes, but most often I’d take down eight or nine pins and then have to pick off the stragglers. When the smoke settled after a game ending strike, I’d scored 190. I remember once or twice bowling in the 170s, but never before had I reached such lofty bowling heights. More importantly, a good time was had by all. Ten Pin bowling isn’t as common in the UK as in the USA. It is probably second in popularity to lawn bowling. But, it shares a lot of similarities with those other favourite British pursuits, darts and pool. All three games are wonderful excuses to gather with friends, have a few drinks, talk, laugh, and play a little sport. I like my miniature Dwarves nuggety. Round, chunky, big beards, and with their feet attached directly to the bottom of their torsos! 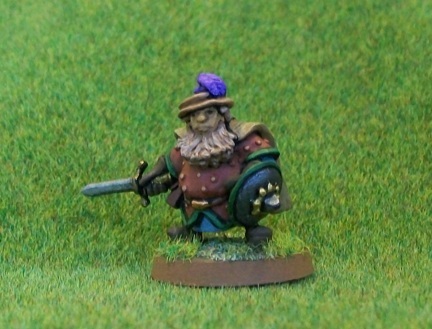 This little guy is part of Wargames Foundry's extensive and terrific range of Renaissance Dwarves.﻿ I've probably got about 25 or so Dwarves of this nature painted up, and at least as many unpainted. They also fit well with the Dwarves orginally produced by Crusader Miniatures, but now owned by Black Hat. One of these days, I'm going to have to get all my Dwarves together and send them on a grand quest to fight a dragon or something. Some works of art are just too good not to share. 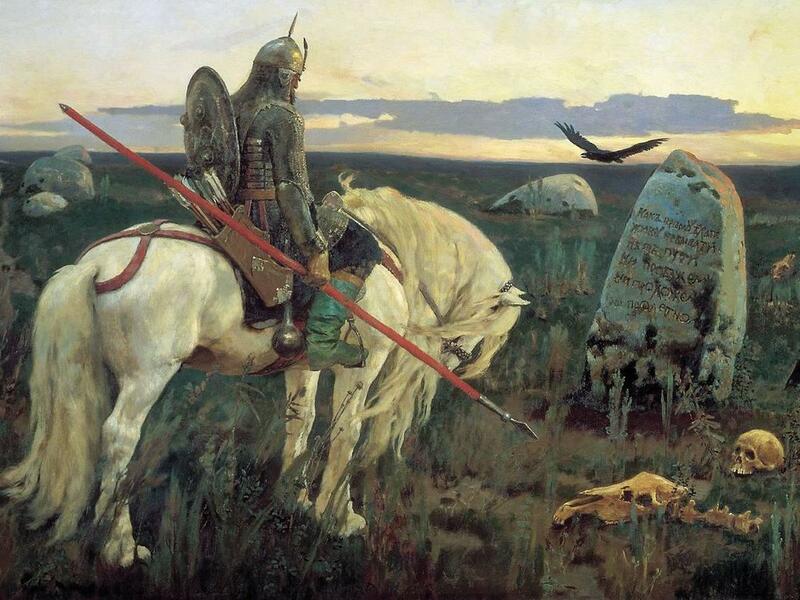 This painting is entitled Knight at the Crossroads by Victor Vasnetov and appears to be in the public domain. Click on it. See the big one. Let it fire your imagination! Alone on Easter, I decided to set off on my own Easter Egg hunt, Geocache style. For those that don’t know, geocaching is a game (sport? hobby?) where people hide containers, usually in undeveloped areas, take the coordinates using a handheld GPS and then post those coordinates online. Then anyone who wants can try and find the cache using their own GPS. Caches usually contain a ‘log book’, so people can log their finds, and often a bunch of little toys or tokens. The idea is that people can take one token from the cache and leave another in its place. I’m relatively new to geocaching, with only 8 caches to my credit, but I’ve already learned to love it. It presents you with a classic treasure hunt, while giving you a great excuse to get out and explore the back paths. So, armed with the coordinates of three caches, I packed up my bike and set off at 8:30 AM. The Easter morning air was cool and damp; the roads were empty. Quickly escaping the confines of Oxford, I travelled down the small roads to the quiet hamlet of Horspath. There I pushed my bike up the steep incline of Castle Hill, chained it to a fence, and set off across a field to discover my first cache. I had brought a collection of small buttons (badges) to leave in the caches (Spider-Man, Animal from the Muppets, and a Dalek). Often I don’t take anything from the caches, but I have a soft spot for coins. (I’m assembling my own pirate treasure you see!). I found a Eurocent and left Spider-Man. 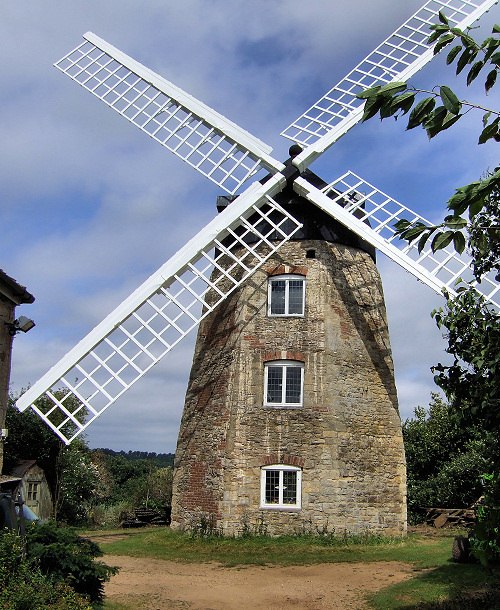 Setting off again, I cycled along a high ridge with astounding views across the rolling countryside, until one sight stopped me dead on my bike, the Wheatley Windmill. I’d never seen it before today, didn’t know it existed. However, a quick internet check at home revealed that it was built in the eighteenth century and has been restored in the last decade. It really is a gorgeous structure. I see on the Wheatley Windmill website that they hold open days. A fun day for the future. Down beyond Wheatley I discovered my second cache in a rusting old wagon. This one contained a full Euro (rich treasure for a cache). I traded it for my Dalek button. The third cache, I never found. I spent twenty minutes fighting my way through brambles and sliding down a steep hill, but all for naught. Two out of three is a pretty good score, all told, so I decided to call it a day. I arrived home four hours after I’d left, having cycled 18 miles, seen several beautiful sights, and carrying a couple of shiny coins as treasure. All-and-all, not a bad Easter Morning. From my house, it is a long, beautiful walk along the Thames River into Oxford. On most days, just before coming in sight of the college spires, I am greeted by the rhythmic cadence of the crew teams as they train upon the river. I’m not a huge fan of the sport, but I enjoy watching the long boats glide across the river, and once a year, I like to watch the famous Oxford/Cambridge boat race on T.V. There was a swimmer in the water, a man who was lucky not to be decapitated. I have little doubt that the man was purposely disrupting the race. I don’t know why, and I don’t really care, but I hope he is punished rather severely by the law. He was last seen being taken away in a police boat. The race official decided to take the race back a few hundred yards and restart the race. I think most will agree this decision was in Cambridge’s favour, they not only gained by the boats once again starting even, but also got back their corner. As it turned out, it may not have mattered. Within the first 100 meters of the restart, the oars of the two boats clashed, and one of the Oxford oars was sheared off. The official ruled that Oxford was in the wrong, and the race continued. Well, I should say the event continued, there was no race at that point, seven oars cannot compete with eight. Cambridge stormed ahead to any easy win. One of the announcers wondered why Oxford even continued to row, arguing it would be better to take a ‘Did Not Finish’ result under the circumstances. I don’t know enough about crew rules to say if the official was right or wrong, I’m guessing it mostly depends on which side you were supporting. Anyway, just to make the whole thing worse, upon crossing the line, Oxford’s bow rower dropped unconscious and lay unnoticed for several minutes by his crew mates (who were all faced away from him in the boat). Once they realized what had happened, the medical boat was quickly called over, and the limp oarsman was passed aboard. He seemed to be mostly okay, when t.v. coverage finally cut away. Some mention should be made of the great sportsmanship showed by Cambridge, who kept their celebrations very muted at the finish line and on shore in difference to the collapsed competitor and the oddity of the race. These men have trained 6 hours a day, 6 days a week for 6 months for this race, it is not their fault that any of these things occurred and it is unfortunate that they couldn’t celebrate their victory as I’m sure they had dreamed it. It was a sad day for British sports. 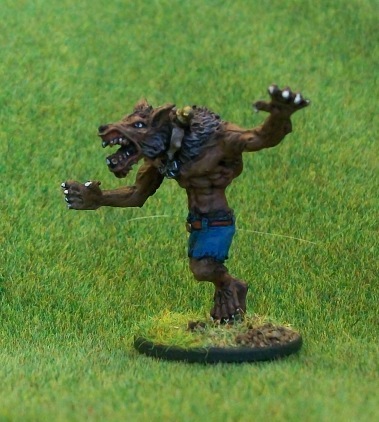 One of the most recent figures to come off my painting table is this werewolf from Warlord Games. Technically it is a Nazi werewolf, but the only indication of that is the Iron Cross he wears on his collar. It’s an oddly proportioned figure with the top half being much larger than the bottom. In a lot of figures this would have bother me, but for this one it seems to work, making the creature more threatening and monstrous. I especially enjoyed painting the figure’s bare flesh, where its rippling musculature helped with the highlights and shading. I remember reading in the Silmarillion that one of Sauron’s early postings (back when he was just a servant of Morgoth) was as the keeper of the Isle of Werewolves. I don’t think it really goes into any detail about the island, but it is one of those ideas that has remained bouncing around my mind over the years. I’m thinking I might need to collect a few more werewolf models so I can run my Demon Hunters through a Werewolf Island scenario. We are back! After two days of serious cycling, my wife and I have completed our circular ride from our front door in Oxford to the famous Uffington White Horse and back. 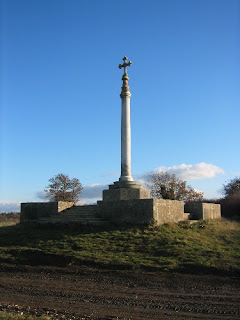 We set off on Sunday morning around 9:30am, travelling by our well-known route to the large town of Abingdon. From there we proceeded south along the river, before veering off to go around the town of Didcot and its skyline-dominating nuclear cooling towers. Two hours in, we made a quick stop for some McDonald’s fries, and then we were off again. Across the railroad tracks, down a road, and then back into Oxfordshire wilderness. We were aiming for the ancient road known as the Ridgeway. Just as we got in sight of the ridge, I heard that dreaded noise from my rear tire. Flat. Setting up a temporary camp, I pulled the tire off and located a needle-thin splinter of wood that had pierced the tire and the inner-tube. I’m certainly no cycle maintenance expert, but I had brought a couple of extra inner tubes, and less than an hour later, we were back in business. I admit it; we pushed our bikes up to the Ridgeway, but having obtained the ancient road (now a byway cleared for walkers, cyclists, and horses), we set off down the bumpy track. The Ridgeway was made for mountain-bikers, but our hybrids performed admirably. 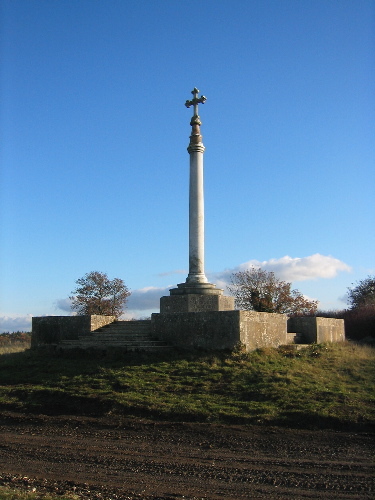 We passed Lord Wantage’s Monument, which is most notable for being such an out of the way place to stick a monument, and the beautiful plunging valley, known as the Devil’s Punchbowl. We arrived at the White Horse after just over 7 hours of travel, before cruising down the side of the Ridgeway to the 16th Century White Horse Inn, where we spent the night. About the White Horse itself, I have only a little to say. To my eyes it has none of the impressiveness of standing stones or borrows, but it is interesting for the mystery of its purpose and for the 3,000 years that the local populace worked together to preserve it. More interesting to me was the vast earthwork fortress that sat on the hill above it. Those Celts had a commanding view from that place. Bring the kids, they’ll love running all over it. After a hearty ‘Full-English’ breakfast, we set off the next morning at 9:30. Wanting to see some different sights, we decided to take a different route back. We started off along the road that runs parallel to the Rideway, before veering off to into the town of Wantage (birthplace of Alfred the Great). From Wantage we found some quiet roads up to Grove, before getting a bit lost on the way to East Hanley. We quickly found the road again, but decided to try another byway that was marked on our map – mistake. The byway became a trail became a path became a field. Somehow, we found ourselves pushing our bikes through a series of empty fields, scaring the hares, trying to find a road. After an hour of pushing, we broke out onto a road, and made our way to Steventon. Drained from our field-pushing, we decided to take the most direct way home, and followed the road back to Abingdon. After a much needed lunch break, we carried on, arriving back home a 3:30. Tired, but triumphant. While this may sound like the next book on my sci-fi/fantasy reading list, it is actually the cycling trip that my wife and I are planning today. 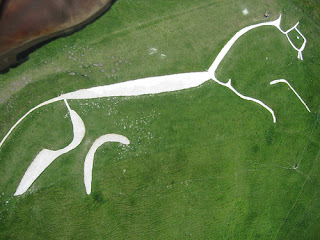 The goal is to cycle from our house in Oxford, down through Abingdon and Didcot, up onto the Ridgeway, and from there to the hamlet of Uffington that sits below the famous and ancient White Horse. There will hopefully spend a pleasant evening and before following the same route back on Monday. I’ll let you all know how it goes!